Midlands Diving Chamber offers a hyperbaric service of the highest standard to scuba divers. The hyperbaric staff and dive doctors at Midlands Diving Chamber are some of the most experienced in the country in treating scuba divers with decompression sickness (an accumulation of over 50 years). All of the hyperbaric staff and doctors at our decompression unit specialise only in hyperbaric medicine (see the MDC Team page) and are not brought in from other disciplines within the hospital. Our Doctors see divers all day, every day -the experience level you should expect from a diving Physician. All staff are regularly trained and attend courses to understand the latest developments within the hyperbaric industry. Staff at MDC lives and breathes Diving Medicine, we pride ourselves on our knowledge and experience levels. Midlands Diving Chamber is a member of the Undersea and Hyperbaric Medical Society (UHMS), the most progressive hyperbaric societies that constantly develops research to understand more about the ways in which hyperbaric oxygen therapy can help both scuba divers with decompression sickness as well as other medical benefits of hyperbaric treatment. Nearly all of the staff at Midlands Diving Chamber (all but one!) are scuba divers themselves, with the chamber staff coming from military and commercial diving backgrounds. The Midlands Diving Chamber runs a 24hour worldwide helpline. Providing support to dive clubs, shops, instructors as well as individual divers on all aspects of diving. We are very happy to provide FREE telephone & email consultations regarding all aspects of diving, from advice on DCI/DCS, diving on medication to problems when diving abroad, in fact, whatever your question, we are here to help…24hours a day…365 days a year. The Hyperbaric Chamber at Midlands Diving Chamber has one of the deepest depth ratings of any chamber in the UK. Not only does this mean we can provide Dry Dives to 50 metres in complete safety (we get nowhere near our working pressure!) but also allows us to run ANY DCI Therapy Table should we need to. The Midlands Diving Chamber is funded by the NHS. As such, regardless of the situation, MDC has never and will never charge divers for its services or advice. In fact, MDC has in the past and will continue to provide treatment to divers who do not qualify for NHS funding. We will never turn away a diver in need. The Midlands Diving Chamber will give fully qualified and diver-friendly advice on all diving medical issues – plus many other scuba diving issues that we are often asked. 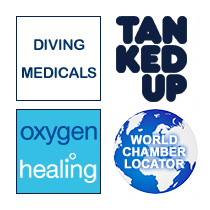 The Midlands Diving Chamber offers many services to scuba divers to help them learn more about hyperbaric medicine, decompression sickness, dive medicals, general dive medicine and other issues of general interest to the diving industry. If you have Adobe Flash Player installed, you can watch the BBC's coverage of the opening of MDC below. Alternatively, you can view the iPhone version (16Mb).